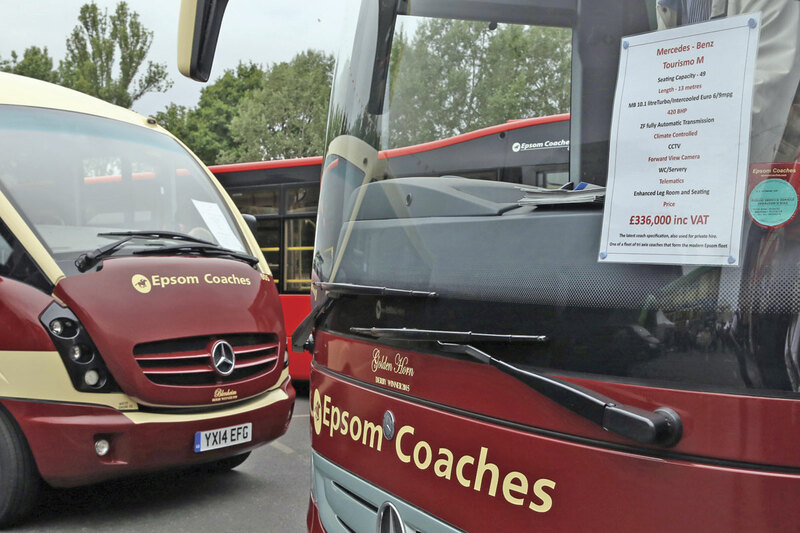 A lot has happened in the five years since Epsom Coaches last held an open day at their modern depot on the outskirts of the Surrey town. Foremost amongst the changes are the fleet increasing by around 30% with a corresponding growth in staff numbers, an increase in turnover of 50% and the sale of the business to RATP Dev by the founding Richmond family, not forgetting that the approach road to the company’s depot was renamed Roy Richmond Way in 2011in honour of long serving company Chairman, Roy Richmond MBE, who had passed away earlier that year. One thing that hasn’t changed according to Managing Director, Steve Whiteway, is the family atmosphere of the business which has an excellent reputation for staff development and retention. 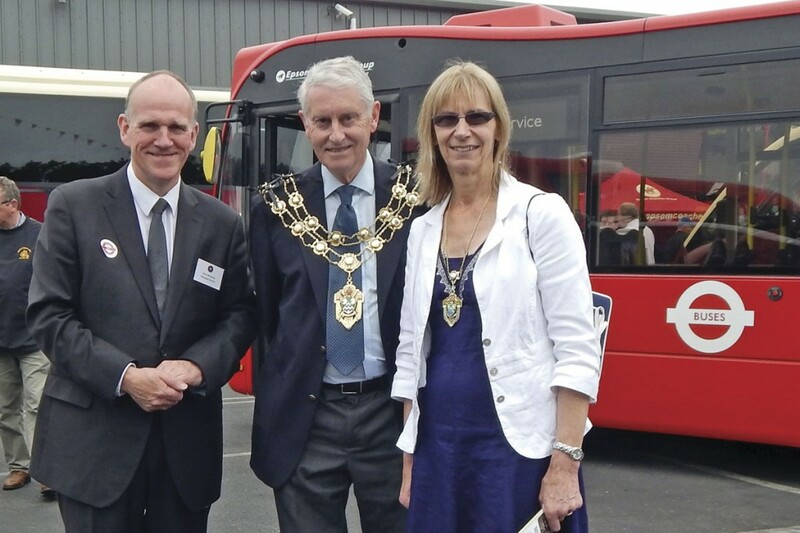 That the business is also important to the community around Epsom that it serves was recognised by the attendance of The Mayor with his wife at the charity open day held to celebrate the company’s 95th anniversary. Under RATP Dev ownership, the business has grown and significant investment has seen around 30% of the fleet replaced in the past year. 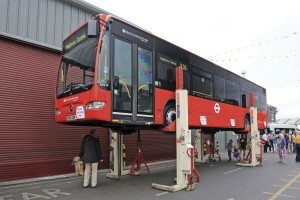 The company now operates 118 vehicles, almost the maximum that the extended site can accommodate. Steve noted that by effective management of the space available, significantly more vehicles can be accommodated than some other operators achieve. 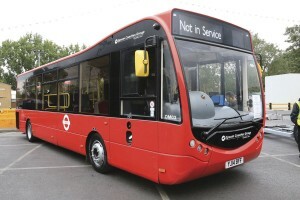 Although Epsom Coaches were involved in early hybrid trials with an Optare Solo, the current fleet is all diesel powered with nearly a quarter of the fleet (24 vehicles) to Euro 6 standard. The business has five key elements, Epsom Coaches holiday and tours, Quality Line bus services for TfL, the Silver Service local bus network in Epsom, NHS and Corporate Contracts and some National Express work. Before opening time, there was a queue of visitors waiting to follow the well planned trail described in the event’s full colour guide. Once the doors were open, the queue was regularly topped up by the shuttle service of two London RF type buses operating to Epsom station. 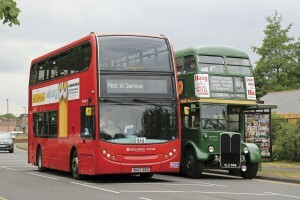 Additionally two green London RT type duplicated some journeys on Quality Line’s TfL route 418. Entrance to the event was through the tour departure lounge where displays commemorated the company’s 95 years of service and its extensive collection of awards was on show. Leaving the departure lounge area, visitors passed through a marquee featuring the Epsom Coaches holiday programme and a variety of suppliers including the Best Western and Marriot hotel chains and Visit Flanders. Trade associations including CPT and Coach Marque were also represented together with The Epsom and Ewell Community Fund, the charity beneficiaries of the day’s events. 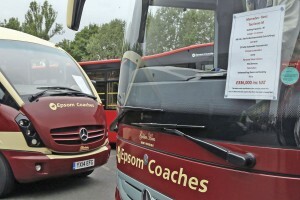 A selection of vehicles from the current Epsom Coaches fleet was displayed alongside classic cars and buses from yesterday. The current coach fleet was represented by the company’s first tri-axle Mercedes Tourismo delivered in time to participate in this year’s UK Coach Rally and a Mercedes-Benz Vario based Plaxton Cheetah, one of a pair delivered in 2014. The Quality Line bus fleet display included one of the 13 Optare Metrocitys new in 2014, an Enviro400 to Euro6 standard, a silver Optare Solo SR from the Epsom local service fleet, the Caetano bodied Dennis Dart SLF driver training bus and a Mercedes-Benz Citaro which appeared off the ground on Stertil Koni lifting columns. All were labelled with their cost new. 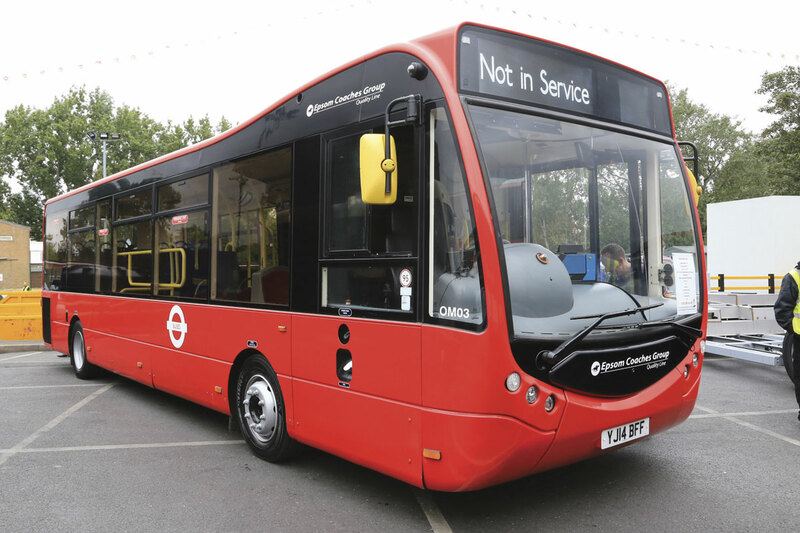 Completing the modern vehicle display were a Mercedes-Benz Sprinter used on Epsom Coaches’ Royal Marsden Hospital contract, a New Routemaster from fellow RATP Dev company London United and an Enviro200 chassis exhibited by ADL. Private owners and both the London Transport Museum and the London Bus Museum contributed to the classic bus display although unfortunately the B type ‘battle bus’ was unable to make it on the day. The oldest vehicle in the display, a 1909 Commer predated Epsom Coaches formation by over ten years. 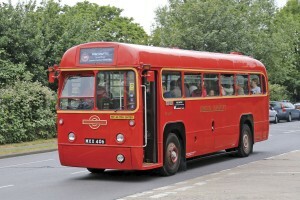 At the main entrance, visitors were greeted by the 1951 Bedford SB1 coach restored to Epsom Coaches maroon livery. The main workshop area was turned over to displays from many of the company’s suppliers together with a popular pop-up café offering anniversary tea cakes on its menu. In the centre was a restored Ford Model T carrier’s bus recalling Epsom Coaches’ first vehicle which was on a similar chassis. 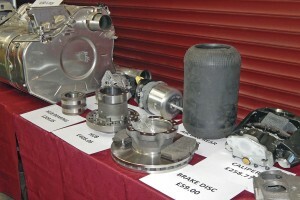 Immediately on entering the workshop, there was a display of replacement parts, mainly supplied by ADL and labelled with their use and price. Alongside, ADL and GKN jointly displayed flywheel hybrid technology. RWT Commercial Services supported the event with before and after examples from their DPF cleaning service that offers a rapid turnaround using an in house collection and return service from their West Midlands workshops. 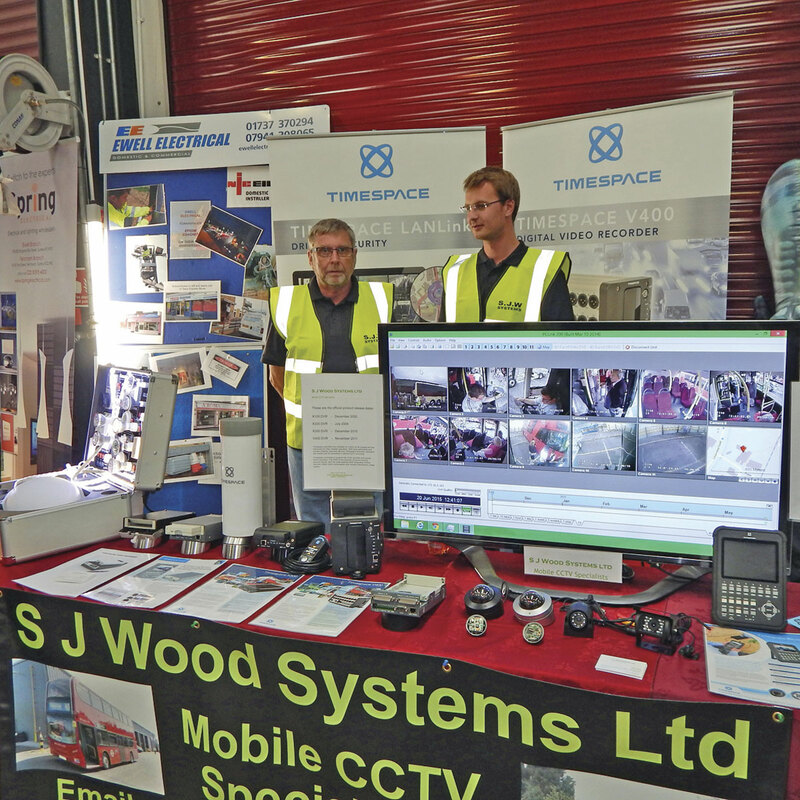 The Quality Line Enviro400 displayed outside was connected wirelessly to the S J Woods Systems Ltd stand where images from its eleven camera system were viewable on a composite screen. 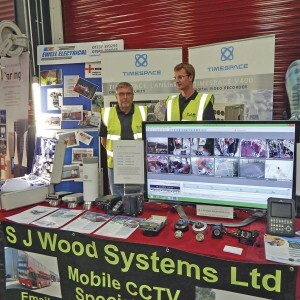 The system utilises Timespace recording and transmission equipment enabling Epsom Coaches to download CCTV data remotely as the vehicle enters the depot. 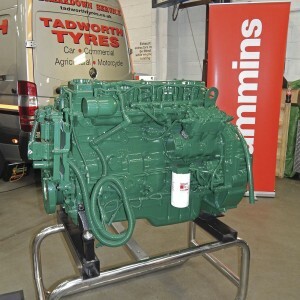 Cummins showed two engines. Attracting a lot of attention was a new Euro6 8.9-litre ISL series with transparent panels to show the pistons moving and attract the attention of budding young engineers. 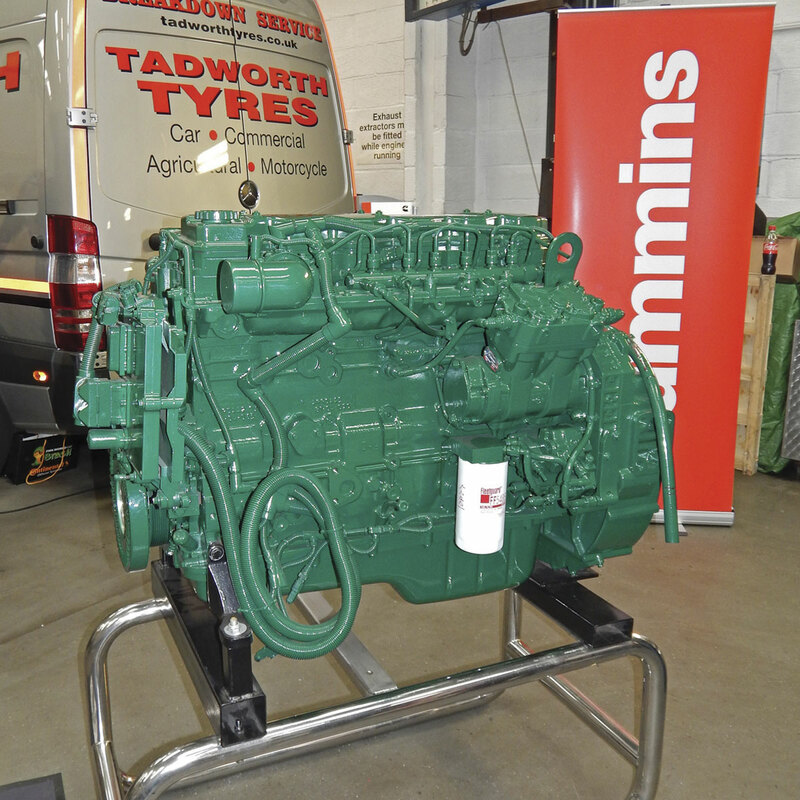 The second exhibit was a green painted remanufactured 8.3-litre ISC series. Nearby was EvoBus’ stand promoting the Tourismo outside that had been recently supplied to Epsom Coaches as a progression from the Setra coaches standardised on for over ten years. Epsom Coaches contract their vehicle cleaning to Nationwide Cleaning and Support Services. Managing Director, Gary Nourse, explained how his company’s services can deliver an effective solution to the often difficult requirement for providing night staff and necessary quality control. Despite the weather attempting to put a dampener on proceedings at times, there was a good footfall of visitors throughout the event and a general feeling of enjoyment. Initial returns for the day show around 4200 visitors and £6000 raised for charity. Many will no doubt be looking forward to see how the company celebrates its centenary in five years time. Steve Whiteway commented that ‘RATP Dev doesn’t believe in destroying what they have bought’ in pursuit of corporate appearances so the family business format can be expected to continue, with the focus as now on being at the forefront of developments in the industry. 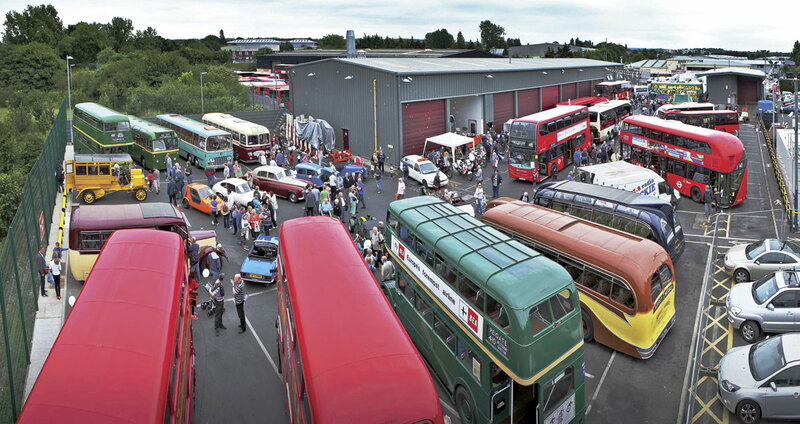 A general view of the event from a cherry picker courtesy of Epsom Coaches.